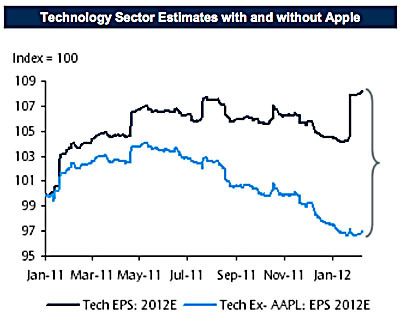 Via Joe Weisenthal, this chart from BarCap shows the growth of the tech sector with and without Apple. Take Apple’s stock out of the equation, and instead of growing 8% over the past year, the tech sector has shrunk about 3%. It’s true that you can see an effect like this on any kind of aggregate index if you remove the top performer, but given the size of the tech sector this is a pretty stunning example of the effect.